Registration Requirements for child care. This list of registration requirements provides a basic understanding of potential requirements. Please check your state's registration requirements or Child Care Regulations. Keep your home a clean, sanitary and safe environment for kids. Making sure all of your indoor and outdoor play areas and equipment are safe. Your state may specify. You may have to have a "land line" working telephone. Also, emergency numbers posted for police, fire, ambulance, and the poison info center. In Iowa cell phones are not sufficient. You'll also post numbers for each child’s parent, a responsible person who can be reached when the parent can't be, and for the child’s doctor near your phone. 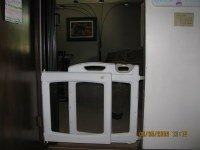 Keep all medications and cleaning supplies locked up/out of a child's reach. This is obvious enough I probably didn't have to list it in these registration requirements. Have first aid supplies on hand. Your state may specify. You can only administer medication with the parent’s or doctor’s written authorization. Any prescribed medication needs a physician’s or pharmacist’s direction with it. Both nonprescription and prescription meds have to be in the original container with readable directions and labeled with the child’s name. All medications shall be stored properly, refrigeration if needed. And of course, stored out of reach! You should draw an emergency plan that you will post and practice with the children- tornado and fire. This may be a part of your city or state's Child Care Regulations. 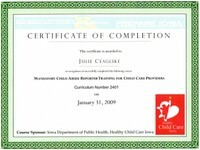 Within the first 6 months of registration you'll attend Mandatory Child Abuse Training (In Iowa we can do online training). This training is usually renewed every 5 years. Attend a valid Infant and toddler CPR and first aid training usually renewed every 2 years. Every person should do this anyway! You will submit your name and names of your family members as well as any employees or substitutes you will have, for criminal and child abuse records check. You may be visited by a local Department of Human Services Rep (DHS) prior to receiving your certificate and then once a year for renewal of your registration to be sure you are in compliance to their requirements. If you are questioning any of these requirements and have not read my page on the benefits of registration, click here to go to my Registration Benefits page. Child Care Regulations are an important part of your business. You don't want to have issues with DHS or any other government agency. Go to the top of Registration Requirements.